Google refined their original seven inch Nexus 7 tablet in every way, and just released the updated model a few weeks ago. 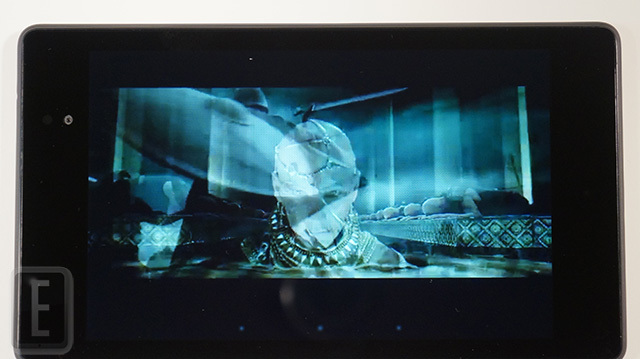 This new device blows away many of the current generation Android tablets on the market. But when it comes to hardware on paper, normally it is not an indication on how it performs in real world conditions. We put this device through its paces to give you an accurate portrayal of how it stacks up against the competition. Let’s look at exactly what Google did: they doubled the RAM, added a 5 MP rear facing web camera, increased the resolution, processor and offers LTE data models. It still does not have a Micro SD card, so you want to go with the 32 GB model to get you through the day. There is also around 10 hours of battery life, but like anything, if you sit and watch Vine videos all day, it will die sooner. Luckily it has wireless charging, so you can sit down at a Starbucks and keep your battery juices flowing. When you look at every other tablet on the market, at least in the seven inch class, nothing on paper really beats this. It surpasses the competition in almost every single way and still provides a stock Android experience. There is no bloatware to bog you down and factory images are available in-case you break anything with your customizations. If you are looking for a great seven inch tablet today, get this. Otherwise, Amazon, Kobo, Sony, Apple and B&N are all updating their products soon. 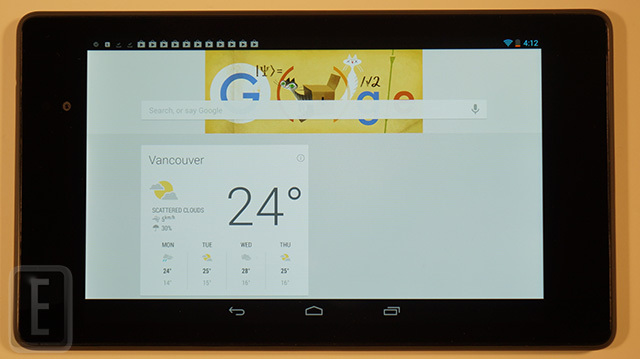 The Nexus 7 second generation gives you a pure vanilla Google Android 4.3 experience. You get everything that comes with the latest version currently available and is compatible with almost every game and app out there. When you first load up the Nexus 7 for the firs time, you have all the ubiquitous Google apps, like Play, Gmail, Maps, Google+ and things like that. Google really went to town on their market the last month, really making it touchscreen friendly. It really looks slick and shines on the Nexus 7 2. Speaking of such, you are not locked into dealing exclusively with Google, but you can easily install 3rd party app markets, for other brands you are loyal to. The fast processor and tremendous resolution makes graphic heavy content shine. Really, the one drawback of super HD screens in general, is that the games and apps are not optimized for them. It is much akin to buying a 4K television and having a small pool of movies to choose from. Still, when we put it side by side with the Kindle Fire HD 7, Kobo Arc and iPad Mini, there was a number of noticeable factors. There were subtle variations in video, pictures, comics and magazines. You know, graphic heavy content, I did notice variants of shades, hues and richer color palette. There is a mad rush of companies using Android to innovate the hardware and scramble to offer competitive advantages. A bigger processor, more RAM, large cameras and higher resolution. One of the fundamental flaws of Android, is that there is no consistency in the hardware, it makes it hard for app developers to optimize their content for so many variances. The higher a studio budget is, the easier it is to optimize, which is why EA and Gameloft titles look amazing.. 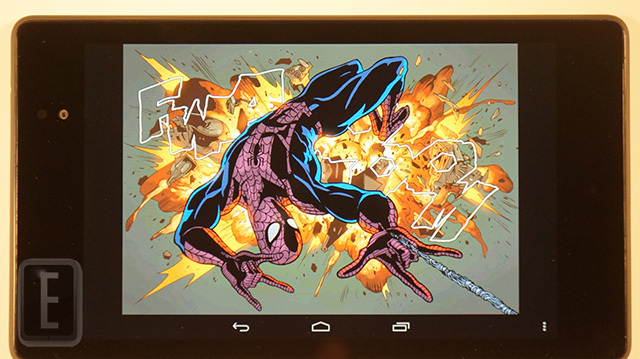 The New Nexus 7 looks amazing when you are reading graphic heavy content like magazines, comic books or manga. Of course, with the high specs this unit has, you will have lightning fast page-turns and new apps will open in a flash. Google sells graphic novels in the Play Store, but to find the best single issues, you will want to download your favorite publisher. VIZ, Marvel, Dark Horse, DC, Archie, and Comixology are all perennial favorites. You will notice an increase of quality in the images, especially if you are upgrading for an older device. Every single major online bookstore has a presence on Android. If you are into Fiction and Non-Fiction you can choose from thousands, including Amazon, B&N, Kobo, or Sony. If you are looking for textbooks, Google now rents them or you can check out KNO or CourseSmart. In general, most mainstream e-Reader apps really are fairly basic when it comes to their iOS counterparts. Most companies realize that it is a fairly popular device, and studies have consistently been proven that Apple users spend more money on content. This presents the situation where iOS gets new features faster than Android. If you want the best e-Reading experience, I recommend to check out solid indie reading apps that are first party, like Moon+ Reader or Aldiko. Really, every single e-Reader app we tried loading up very fast, and the problems we had, were with the actually coding of the app. Zinio for example, crashes if you have it open in a multitasking environment and come back to it later. You can’t really fault the Nexus for that, but this situation is evident in many apps in general. 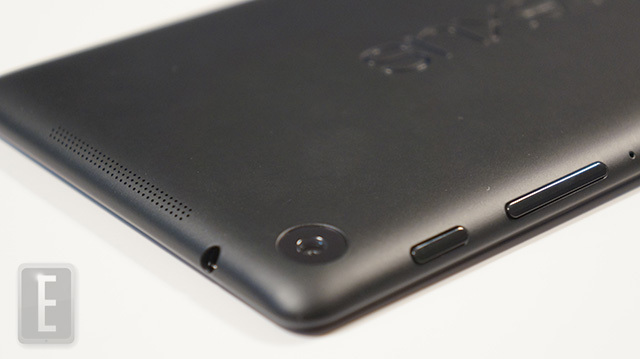 The Nexus 7 is likely the highest performing tablet on the market. On paper it looks amazing and in real world circumstances, gets the job done. I firmly recommend this device, if you ever had a cheap $100 Walmart tablet or something by Aluratek, you owe it yourself to get this. 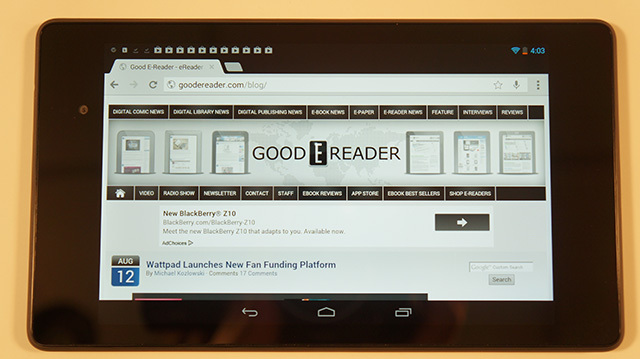 The Nexus 7 is an adequate ebook reader, I use mine all the time. However, when comparing it to a dedicated ebook reader such as a Nook or Kindle, it is lacking. The “glowlight” feature on a dedicated ebook reader makes reading easier in a low light situation & it’s non-reflective screen makes it easier to read in an area with bright lights or outside in the sun.